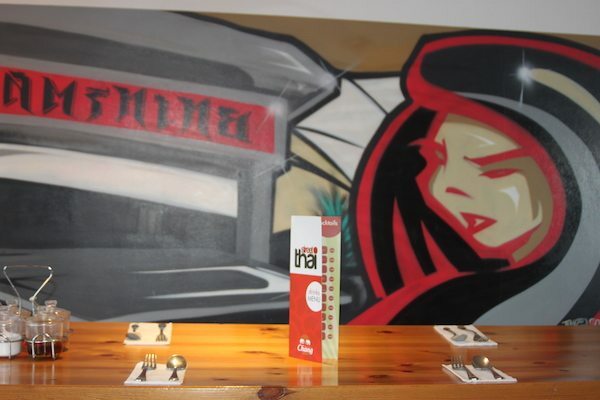 Street Thai is located in the heart of The Lanes, although a little hidden away, in Brighton Square – a location that historically has proven tricky for some. Seeing many shops and cafes come and go over the years, Street Thai – for the time being at least – seems to have a steady flow of customers. 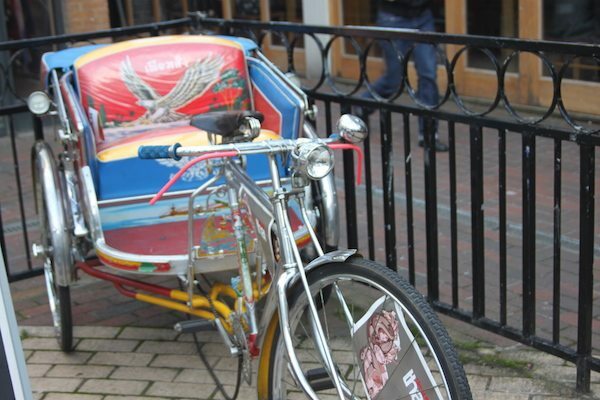 The aim: to produce healthy and delicious Thai dishes made with the finest and freshest ingredients. The menu: speciality dishes from all over Thailand, with a particular emphasis on traditional Thai street food – hence the name. The exterior is clean and modern, with a visible, spacious, roof terrace. The inside is similar, with a touch of Asian flare in the shape of some interesting graffiti art, along with some more traditional pieces scattered amongst the simple wooden furniture. The vibe is unlike many of the other Thai restaurants in Brighton; Street Thai is clearly trying to mix a more contemporary aesthetic, with a traditional menu. It is a big restaurant over two floors, but despite being a Tuesday night, it is relatively buzzing. We are greeted at the door by two different members of staff, one who appears to be the manager on this evening. We have a little wait while they decide where to seat us, but once sat down, we are promptly offered drinks. Veering away from my go to Chang beer – the classic accompaniment for any Thai dish – I opt for a large glass of Merlot (the house red). My partner stays loyal to the Chang, and to make up for my fickleness, orders a large bottle. While we wait for the drinks, we are presented with two menus and some prawn crackers with a sweet chilli sauce. I had noticed outside, the set menu advertised; one of the menus outlines the options available here. 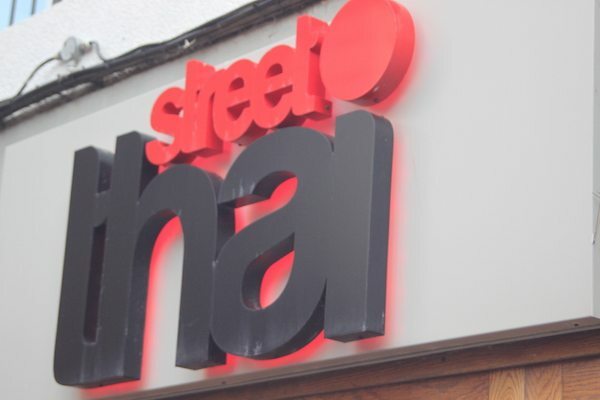 The other menu is an a la carte, listing all the starters, mains, and desserts available at Street Thai – all the usual suspects and some more surprising additions. 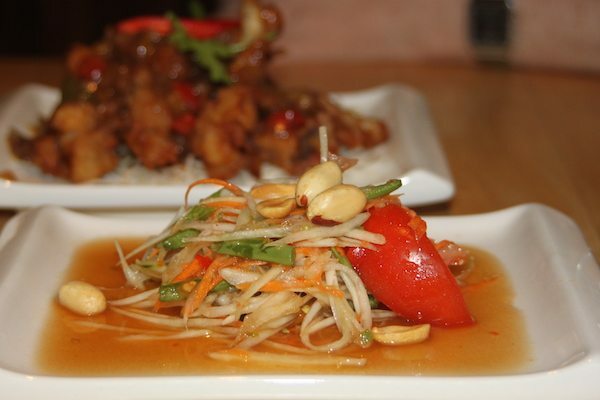 All dishes – with the exception of one – are named in Thai, which adds authenticity. 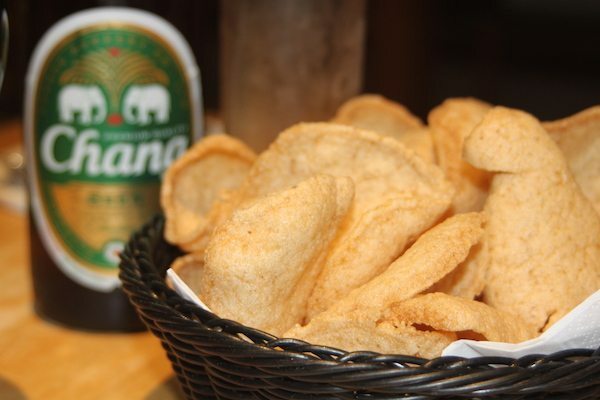 There is also a short paragraph explaining the tradition of Thai street food, which reinforces Street Thai’s culinary inspiration. I decide to try out the set menu, to establish if it is as good value for money as it appears. The options are relatively limited – compared to the full range of dishes that are available on the a la carte – but there is a fair selection of mains, offering one fish and two vegetarian options, as well as three meat options. It’s no surprise that the set menu includes a red, green and yellow curry, arguably the most popular Thai dishes amongst western diners. Slightly surprising to me is that the Pad Thai does not make the cut; this is however available on the a la carte. I am delighted to see that one of the four starters on the set menu is ‘Som Tam’ – spicy green papaya salad – a dish I grew very attached to when travelling around Thailand. Traditionally served as a spicy dish – even for the Thais – I look forward to seeing how this one lives up to my expectations. I also order the red pumpkin curry for my main, noting that each table has a selection of condiments, including chilli flakes, so I can spice it up if I need to. My partner takes the a la carte; he has his eye on a few dishes. The Pad Pak Boong – stir fried morning glory – would certainly be a trip down memory lane. A big fan of chicken wings, it is hard for him not to order the Pik Gai Tort – deep fried chicken wings with garlic and black pepper. 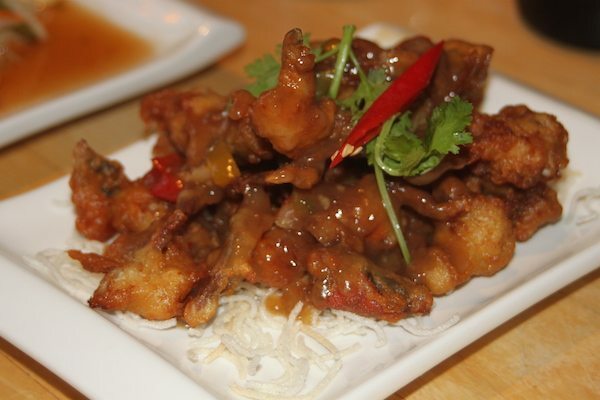 He finally decides tonight he is going for the Bhuu Nim Prik Thai Dam – deep fried soft shell crab – as he fancies going for something not commonly found on a Thai menu. From the good selection of mains – Curries, Salads, Noodle Stir Fries/Stir Fries and Soups – he gets his chicken fix in the form of the Kao Mon Gai Tod – marinated chicken thigh, deep fried with butter and ginger rice. I question the fact that he has ordered two deep fried dishes, but he seems set on his choices. Starters arrive promptly. The crab is a more generous plateful than my salad, but quantity is not everything. It looks the part, and tastes quite authentic. It certainly has a kick, and all the right ingredients are there – the nuts, the crunchy papaya, the sweet and sour dressing; overall it is a very enjoyable dish and I could certainly have eaten more of it. My partners soft shell crab is also a perfectly pleasant dish. The overall flavour is of something deep fried, but this is not unexpected. The batter is not greasy and the flavour of the crab is subtle but not overwhelmed by the mild curry sauce that the battered bites are coated in. For some added flavour, the dish is garnished with a scattering of fresh chillies. The starters are cleared, we exchange some words about the food across our large wooden table, and in not much time at all, our mains are served. My curry is a vibrant bowl of vegetables in a red, coco-nutty sauce. There is a lot of it, so I am suddenly grateful for my more modest sized starter. The sauce is super creamy, with a consistency that reminds me more of a Pha Naeng – richer and thicker. However, the presence and distinct flavour of the Thai basil, and an agreeable variety of veg – including plenty of pumpkin – make this a satisfying dish. My partner’s main is very simple, if not a touch plain to look at. The fried chicken is sliced to the side of the rice and served alongside a bowl of stock and some more sweet chilli sauce – this adds a bit of colour to the plate. It is a little confusing at first, working out how all these elements come together, but the manager advises us there is no particular way to enjoy the meal when we ask her. The stock is very appetising; I find this the most interesting part of dish, with the most authentic taste. The chicken is deep fried comfort food, although somewhat predictable flavour wise. 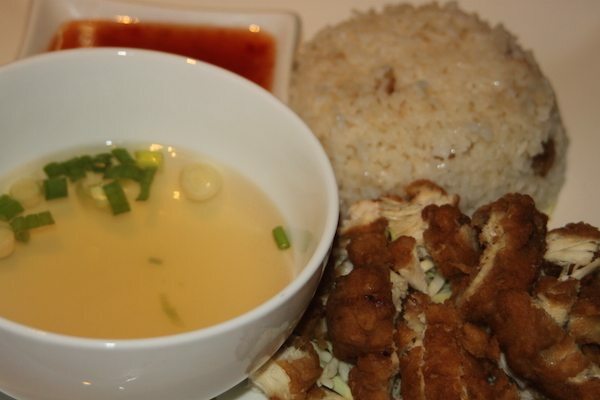 The rice is noteworthy; the ginger is a nice addition to this unassuming side. Dessert is optional with the set menu, but with the difference being only £2, it would be rude not to. 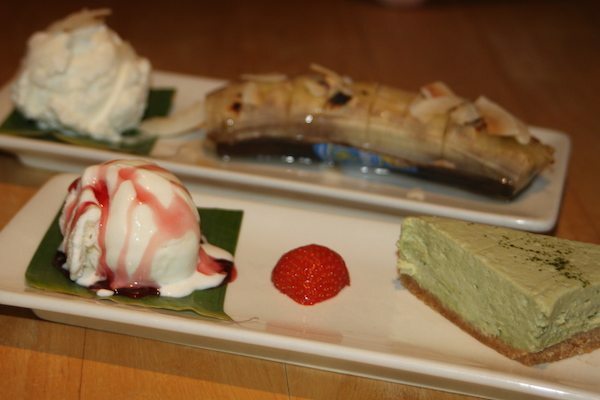 I take a recommendation from our waitress, and go for the Lamai Green Tea Cheesecake. My partner always finds room, and is weak in the face of any kind of banana dessert. He’s sold on the Gluai Ping – The grilled whole banana with aromatic Thai style sauce and a side of ice-cream. We don’t regret either choice; the desserts look great, and taste better. 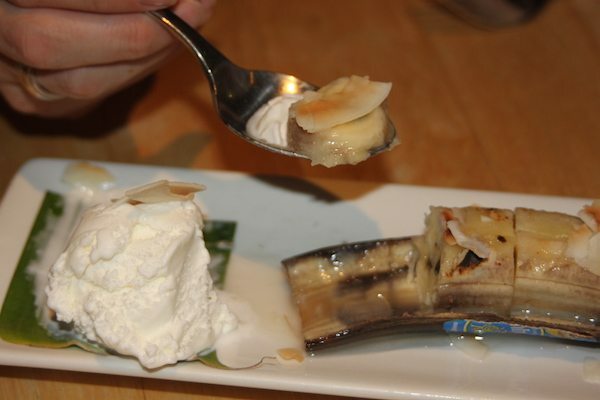 We have been treated to a side of coconut ice-cream – served with the banana instead of the standard vanilla – as our waitress tells us it is better. She’s not wrong! This combination of soft baked banana, coconut ice-cream and peppering of flaky nuts really works. 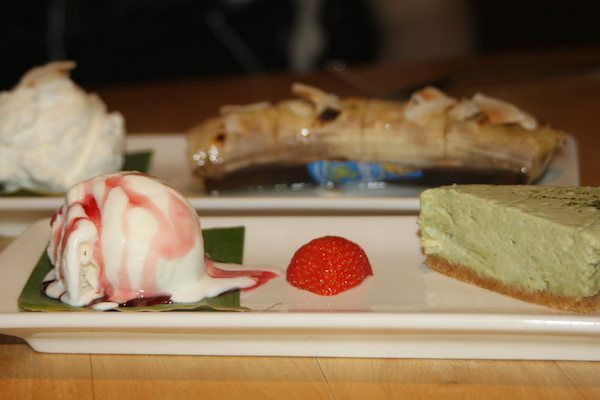 Visually, the green cheesecake slice and the raspberry swirls in the ice-cream, make this a really interesting dish. 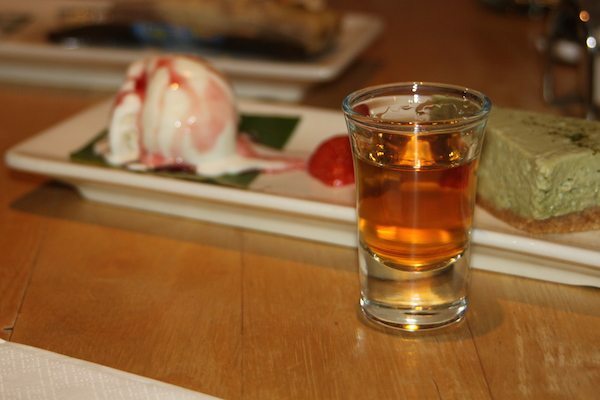 It is creamy and sweet, with notes of green tea; I thoroughly enjoy every mouthful! Street Thai can be very good value for money. The set menu is undoubtedly a good shout for a mid-week meal out, at £11.95 for a starter, main and dessert. 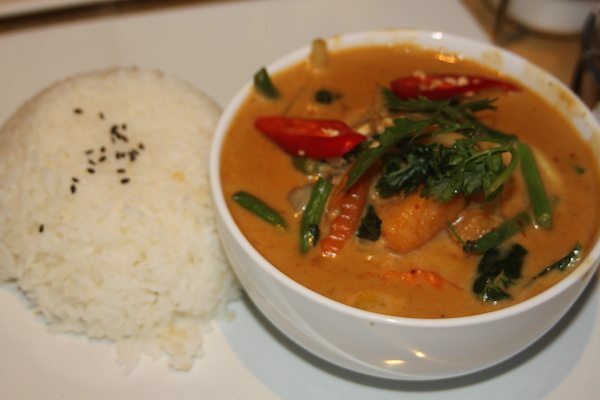 The a la carte menu offers a good selection of dishes you would expect from a Thai restaurant, as well as a fair choice of teas, and many other drinks. The décor is modern, and the restaurant spacious, lending itself well to larger groups. The roof terrace is as nice addition, and definitely a selling point in the summer months. We have enjoyed our meal this evening, and note that our fellow diners share this sentiment.